The archipelago Haida Gwaii lies 80 km off British Columbia and is home to a number of endemics including a subspecies of American Black Bear, Euarctos americanus carlottae (Byun et al. 1997). It seems surprising that a viable population of bears could survive on such isolated and small islands (~10,000 km2 total) which is made further remarkable by Haida Gwaii American Black Bears being the largest subspecies (Byun et al. 1997 – citing Foster 1965). 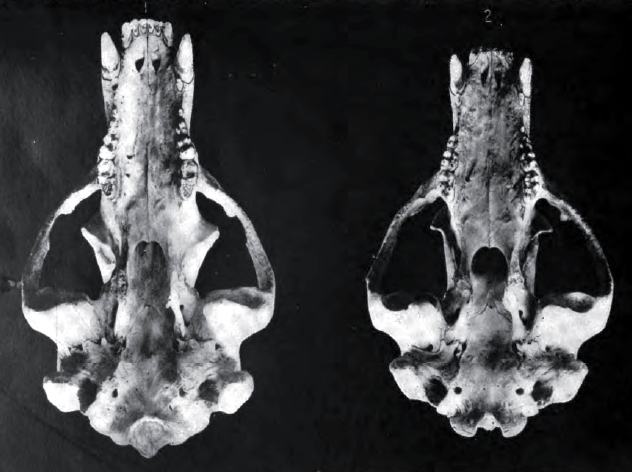 Haida Gwaii bears also have distinctive morphology compared with other bears including a more elongate skull, narrower rostrum, less arched cranium and larger teeth with particularly elongate last upper molars (Osgood 1901). Haida Gwaii Black Bear (left) and a more typical Black Bear, presumably mainland. From Osgood (1901). Despite their distinctive morphology, an early mtDNA analysis failed to distinguish Haida Gwaii bears from their coastal relatives (Byun et al. 1997). This, coupled with the coastal/island bears clearly grouping away from continental subspecies, was interpreted as indicating that the coastal/island bears had a recent common ancestor from a glacial refuge, probably in the (now submerged) Hecate Strait (Byun et al. 1997). Agnarsson et al. (2010) found similar results with coastal/island bears forming a distinct clade and with its sub-clades having low bootstrap values (i.e. being infrequently recovered). I’m curious why the Haida Gwaii bears themselves formed a clade only half the time – gene exchange with the mainland certainly cannot be common – but perhaps it could indicate just how recently evolved the bears are. Humans have inhabited Haida Gwaii for 8000 years (Reimchen 1998) and it is strange to think that a distinctive subspecies could evolve while sharing an island with our species. As for how the Haida Gwaii bears got their size, Byun et al. (1997) hypothesized that they represent the ancestral size while other American Black Bears shrunk. Wolverton & Lyman (1998) commented that large bears from the American Midwest assumed to be Pleistocene in age because of their size were actually only a couple hundred of years old, which makes me wonder if similar assumptions led to Byun et al.’s hypothesis. Whether large size was retained or gained, island-dwelling Black and Brown Bears (Ursus arctos) are generally larger than their mainland counterparts (Meiri et al. 2006). One striking example is the Kodiak Bear (U. a. middendorffi) which parallels the Haida Gwaii bears in being the largest subspecies and living on a surprisingly small archipelago (~14,000 km2) in the Pacific Northwest. What factors could there be on islands which allows them to support bears of such size? For Brown Bears, coastal salmon-eating bears were the largest (Hilderbrand et al. 1999) and Haida Gwaii bears consume considerable amounts of Chum Salmon (Oncorhynchus keta) (Reimchen 2000). Of course I haven’t seen a correlation between salmon availability and Black Bear size tested yet and there could very well be a host of other minor factors which allowed Haida Gwaii bears to reach their superlative size. Say, isn’t there supposed to be an ‘Island Rule’ where large mammals get smaller and vice versa? It seems not to apply to carnivorans (Meiri et al. 2006) – so why is it still referred to as a “rule?”? Agnarsson, I. et al. (2010). Dogs, cats, and kin: A molecular species-level phylogeny of Carnivora. Molecular Phylogenetics and Evolution 54, 726–745. Available. Byun, S. A. et al. (1997) North American Black Bear mtDNA Phylogeography: Implications for Morphology and the Haida Gwaii Glacial Refugium Controversy. Evolution 51(5), 1647-1653. Available. Foster, J. B. (1965) The evolution of the mammals of the Queen Charlotte Islands. BC Prov. Mus. 14, 1-30. Hilderbrand, G. V. et al. (1999) The importance of meat, particularly salmon, to body size, population productivity, and conservation of North American brown bears. Canadian Journal of Zoology 77, 132–138. Available. Meiri, S. et al. (2006). The generality of the island rule reexamined. Journal of Biogeography 33, 1571–1577. Available. Osgood, W. H. (1901) Natural history of the Queen Charlotte Islands. North American Fauna 21, 7-50. Available. Reimchen, T. E. (2000) Some ecological and evolutionary aspects of bear–salmon interactions in coastal British Columbia. Canadian Journal of Zoology 78, 448–457. Available. Reimchen, T. E. (1998) Nocturnal Foraging Behavior of Black Bears, Ursus americanus, on Moresby Island, British Columbia. Canadian Field-Naturalist 112(2), 446-450. Available. Wolverton, S. & Lyman, R. L. (1998) Measuring Late Quaternary Ursid Diminution in the Midwest. Quaternary Research 49, 322-329. Available.